The live screening of sixth and final concert set to happen at the SM Megamall on March 31. A representative of the theater chain SM Cinema has told Anime Pilipinas that the live screening of the much-awaited μ’s Final LoveLive! 2016 ~μ’sic Forever~ concert event in the Philippines has been green-lit for Thursday, March 31. The live screening is set to happen at Cinema 3 at the SM Megamall in Mandaluyong City, which has a capacity of approximately 600 people. The broadcast will start at 03:00pm, the same time as the event at the Tokyo Dome in Japan, and will last for about six hours long. Tickets are priced at PHP1,100 (about USD23.70) and a special item will be given away to all ticket holders during the day of the screening. You may buy your tickets through online at bit.ly/LoveLiveSMCinema starting Wednesday, while ticket selling through SM Cinema branches starting Saturday, March 26. With regards to the second day of the concert, happening on April 1, the representative of theater chain says that it will depend on the ticket sales and outcome of the live streaming event, considering that the broadcast would occupy half of the mall and theater hours. 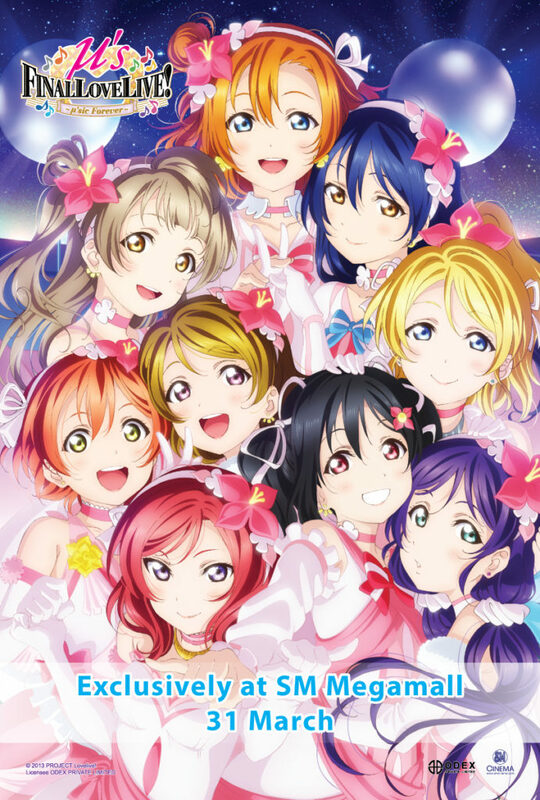 μ’s Final LoveLive! 2016 ~μ’sic Forever~ will be the sixth and final solo concert of the cast of Love Live! School idol project, which is set to happen on March 31 and April 1 at the Tokyo Dome in Japan. It has been reported that the voice actresses’ contracts are set to expire at the end of March, but Emi Nitta (“Honoka Kousaka”) stated that the concert will only be the final concert of the group μ’s as a whole and as a solo act, and does not consider it as a “break-up”. The concert is also set to be screened live in South Korea, Taiwan, Hong Kong, Thailand, Singapore, Indonesia, and Malaysia among others. UPDATE: Multiple sources had reported that ticket selling at SM Cinema branches will start on Saturday, March 26, and only ticket selling through the website has started on Wednesday. UPDATE 2: Ticket selling at SM Cinema branches will start on March 26, not March 27. We regret the error.